So now that we are calm and cleansed from the last two posts, we can set up some protection with a magickal cup of tea. I am crazy about chai tea. The chai tea latte from Starbucks can get my motor running when my energy is dragging. I know, it’s probably the sugar combined with the caffeine that revs me up but every once in awhile I treat myself. 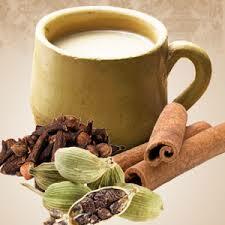 It just so happens that the cinnamon and cloves that are often found in chai tea carry a protection energy vibe. Many protective plants have spines and spikes that hint of their ability to protect. If you look at a whole clove you will notice that it has little spikes all over it. If you have ever tried pushing those little suckers into the peel of an orange to make one of those pomanders, you understand their ability to inflict pain from the way they hurt your finger tips! I know I have protection true! to serve me in this magickal hour! I ‘m safe and secure with nothing to fear! Know that you are safe and protected…… and enjoy the rest of your tea!